Is Crescent right for you? Find out! If you're not familiar with Craps, it is essentially a game played with dice in which the players make wagers on the outcome of the roll, or a series of rolls, of a pair of dice. Players may wager money against each other ("street craps") or a bank ("casino craps" or "table craps"). Because it requires little equipment, "street craps" can be played in informal settings. Legend has it, Roman soldiers invented the game of craps using knuckle-bones of a pig as dice and their armor shields as a table. 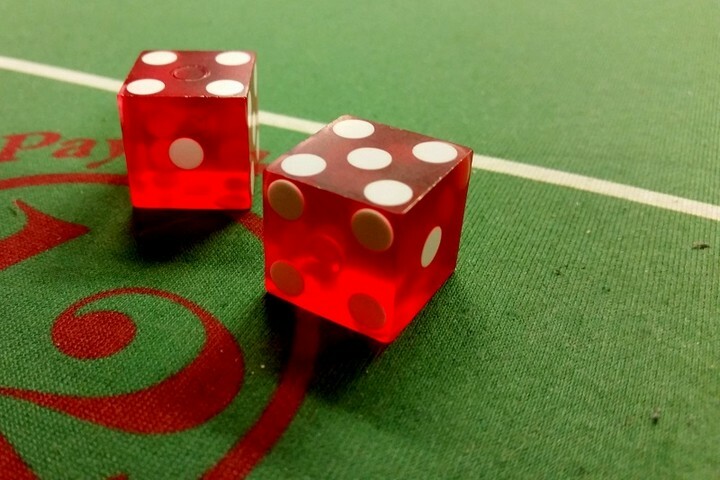 Others believe craps originated from an Arabic dice game called Al Dar, which means “dice” in Arabic, and that merchants brought the game over to Europe in the 12th Century. The most commonly accepted version of the game's creation is that it was invented by Sir William of Tyre in 1125 during the Crusades and named after a castle named “Asart” or “Hazarth.” Later called “Hazard." Fast forward a bit, this English game “Hazard” became extremely popular in French taverns during the 17th Century. Because it required little equipment, "street craps" could be played in informal settings. It is believed around this time the name "craps" was invented as a spinoff of the French word “crapaud,” meaning " toad" in reference to the original style of play by people crouched over a floor or sidewalk. What later became the American version was brought to New Orleans by Bernard Xavier Philippe de Marigny de Mandeville, a wealthy gambler and politician descended from colonial Louisiana landowners. A flaw in the game allowed players to exploit the casino until American dice maker John H. Winn, also know as the father of the modern game, corrected this issue during the 19th Century by introducing the "don't pass" betting option. It was his version that continued to flourish, spreading throughout the French Louisiana colony of Arcadia and later along the Mississippi river in gambling boats. In 1931, the explosion of Las Vegas gambling lended even more popularity to the game. Looking for a fun and exciting career? Crescent School of Gaming and Bartending can train you for a dynamic, well-paying job in the hospitality or casino industry today. You can be ready to bartend in just three weeks. Be around fun people and have cash in your pocket every night as a mixologist, or claim your place in the ever-growing casino gaming industry in as little as three months. Financial aid is available, if qualified. You can start one of Crescent's top-quality programs with no money down. Crescent is the only nationally-accredited bartending and table games dealer school of its kind in the United States. By submitting this form, you are giving your consent for Crescent School of Gaming and Bartending to contact you regarding our programs and services. Feel free to contact us with any questions.